Aqualife's Harbor spa is your own at home oasis. This spa gives you luxury in a durable unit with a low maintenance, impact resistant exterior. All 24 jets are powered by a two-speed energy efficient pump that allows you to have a quiet evening or melt away the day's aches and pains with the high-speed hydrotherapy setting. A digital back lit control unit allows you to customize your experience while you enjoy your spa. With seating up to 6 people with a lounger this spa is designed to suit everyone. This rotationally molded spa is made from quality granite resin that features a perimeter insulated interior allowing your spa to retain optimum heat from your all-season stainless steel heater all year long. Ready to go right away with its featured PLUG & PLAY connection this spa will perform all year long. The Harbor spa also comes with a heavy duty, insulated cover with locking clips that allows you to close your spa to the elements. Enjoy the benefits of true luxury in the comfort of your own home. The Alberta SE Hot Tub is packed with high-end features such as Bluetooth Audio, LED mood lighting, 4 waterfalls, and aromatherapy. It is equipped with two 5 horsepower, 2 speed pumps that accommodate 4 different speed control configurations. Four air control valves help to ensure that everyone sitting in the hot tub is satisfied with their jet pressure, while 57 adjustable hydrotherapy jets allow for total customization. This is the ideal tub for family use, with enough space to comfortably seat 6 people while two captain's chairs and a lounger help to ensure everyone will get the pampering they deserve. Our 9-step water purification system incorporates Ozone sanitization and 100 square feet of Microban SilverStream filtration to help ensure crystal clear water. The St. Lawrence Swim Spa features a unique Swim Lane system that uses 3 resistance jets and 2 profile aligning jets to ensure that you receive the appropriate pressure and support needed for exercise. Other features include 200 sq. ft. of filtration along with an included ozone generator to keep your spa's water clean and an Mp3 sound system with pop-up speakers. 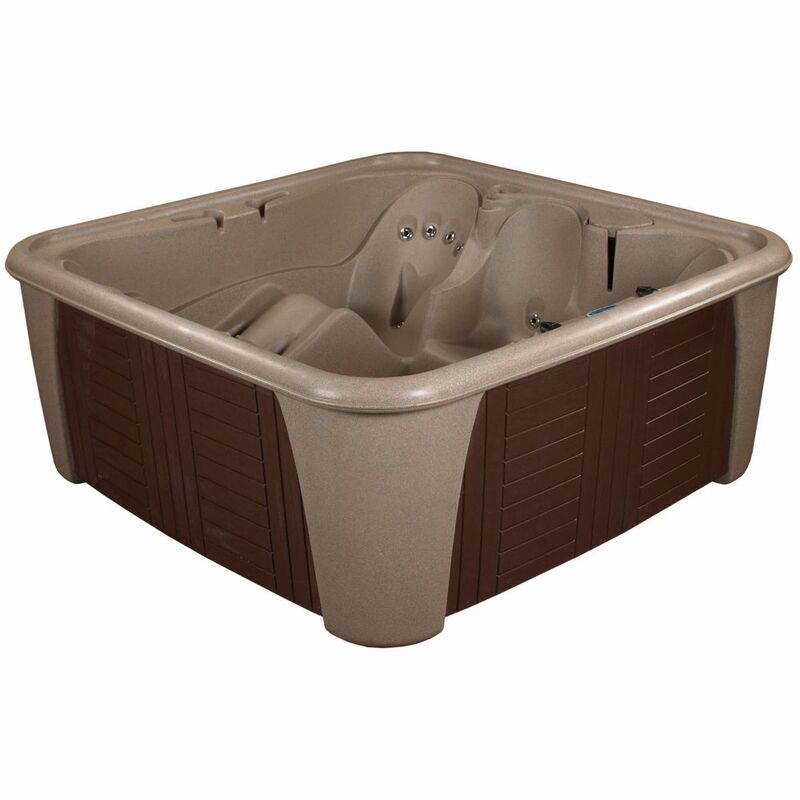 Harbor 24 Jet Cobblestone with Lounger Standard Hot Tub PLUG & PLAY Aqualife's Harbor spa is your own at home oasis. This spa gives you luxury in a durable unit with a low maintenance, impact resistant exterior. All 24 jets are powered by a two-speed energy efficient pump that allows you to have a quiet evening or melt away the day's aches and pains with the high-speed hydrotherapy setting. A digital back lit control unit allows you to customize your experience while you enjoy your spa. With seating up to 6 people with a lounger this spa is designed to suit everyone. This rotationally molded spa is made from quality granite resin that features a perimeter insulated interior allowing your spa to retain optimum heat from your all-season stainless steel heater all year long. Ready to go right away with its featured PLUG & PLAY connection this spa will perform all year long. The Harbor spa also comes with a heavy duty, insulated cover with locking clips that allows you to close your spa to the elements. Harbor 24 Jet Cobblestone with Lounger Standard Hot Tub PLUG & PLAY is rated 5.0 out of 5 by 1. Rated 5 out of 5 by choppersrule from This is my first hot tub and I decided on this model over others mainly based on the manufacturer... This is my first hot tub and I decided on this model over others mainly based on the manufacturer warranty. This tub gives you a 1 year warranty and a majority of the other plug and play tubs were only a 90 day warranty. This tub comes set up to use 110v, but can also be converted to 220v. This was another feature I liked about it. I also wanted a plug and play tub since I figured that if I wanted to sell it in the future if I upgrade to a 220v only tub it may be easier to sell to another first time hot tub user. I have only had it less than a month so I do not yet know how much my electric bill has went up. The jets are nice and there seems to be a good amount for a 110v tub. They have what seems to me to be good pressure when the pump is on high. The tub took a little over 24hrs to heat the water to 98 degrees from a starting temp of 59 degrees. This was in mid 70 degree weather. It took longer to receive the tub than what was originally stated when I placed the order. I was later told that Aqualife manufactures the tub when it is ordered, and they do not have any in stock ready to ship when the order is placed. I do not know if this was due to the time of year I placed the order, or if that is just how the company does it. I was fine with waiting longer to receive my order. The tub is sealed on the bottom which I like since it is sitting on a stand I built for it. I used 2x4s and plywood to build the stand to raise it a little so it was not sitting directly on concrete. I am not sure how much insulation is in the walls, but it appears to hold the temperature pretty well. At least in summer. I would like to convert it to 220v before winter sets in here in the midwest as I think it will have an easier time holding temperature using 220v. I also plan on building a small enclosure to encase the sides of the tub. I want to insulate the sides of the tub more with this enclosure to hold heat better, and it will also give me a place to put my drinks on when using the tub. I do not like the access panel to the pump. You must remove hole caps, then remove several screws to remove the panel. The screws appear to be just screwed into the plastic side of the tub. It is also a pain to put the panel back on. Granted, you only have to remove the panel it when it comes time to drain the tub but it could definitely be engineered better. The next time I remove the panel I plan on putting heavy duty velcro on it and use this to hold it onto the tub instead of using the screws. Overall, I like the tub and would recommend it to someone looking to purchase a plug and play hot tub.